It's still not pretty... and still doesn't look like much is done... but it was a very productive day. I don't generally like busy, chaotic, crazy days full of non-stop visitors. It was very welcome after so many days of just being stuck here waiting and having nothing happen and a bunch of no show people. The day started with Isreal showing up just before 9am. He started working on the insulation. Next, the plumbing inspector showed up. He was here for a short time and passed us on our plumbing. Yeah!!! Next, the plumbers showed up around 9:45. They were 2 different plumbers from last week. After a bit of confusion on where exactly the heater plumbing was supposed to go, (an hour of searching in our basement and outside crawlspace that the other plumber had already done last week) they figured it out. By noon they were done with their work on the new heater and were gone. Next the electrical inspector showed up. He was here for just a little while and passed us on our electric work. Hooray! Isreal finished the ceiling insulation. 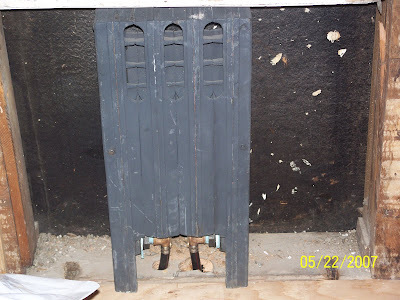 He also spoke to the insulation inspector (who came yesterday to see no insulation). The inspector said as long as he completes the insulation job and takes a bunch of digital pictures to give the inspector, he will pass us without coming here again, and Isreal can just start closing up the walls and ceiling. finish the ceiling he started ripping up and replacing the floor with new plywood. After all the holes that were cut out of the floor I was glad it was all replaced and not just done in patchwork. Much better in my opinion... at least it looks all "
and new". He didn't completely finish the floor, but that will be his first job tomorrow morning. He also will spend the day closing up the ceiling and walls... and possibly getting the tub in! Yes... you heard me right. 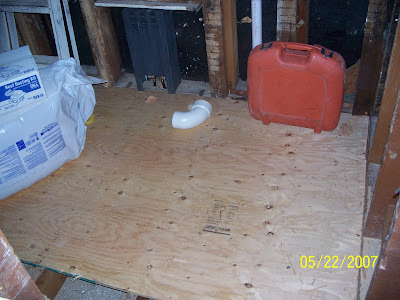 This lovely plywood floor will have a tub sitting right there. That orange case will be right where you can imagine my head resting while I take a long awaited bubble bath. Isn't that just a lovely thought? I never would have imagined being so happy seeing insulation and plywood. 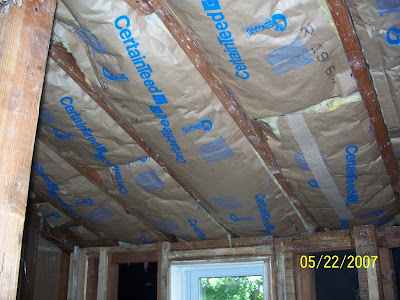 But, boy am I thrilled with my insulation and plywood!! !